Japan's Cherry Blossoms In Brief, Beautiful Bloom The pale pink flowers are coming into bloom just weeks after an earthquake and tsunami devastated the country. Japanese art expert James Ulak talks with NPR's Linda Wertheimer about how the cherry blossoms have long symbolized the fleeting nature of beauty and life. Wind-screen and cherry tree is one of the works on display in the Seasons: Arts of Japan exhibit at the Freer Gallery of Art in Washington, D.C. It's cherry blossom time in the nation's capital — throughout Washington, D.C., cherry trees look like pale pink clouds settling on the city's parks and streets. The oldest trees are a gift from Japan, where the flowers have long symbolized the fleeting nature of beauty and life. 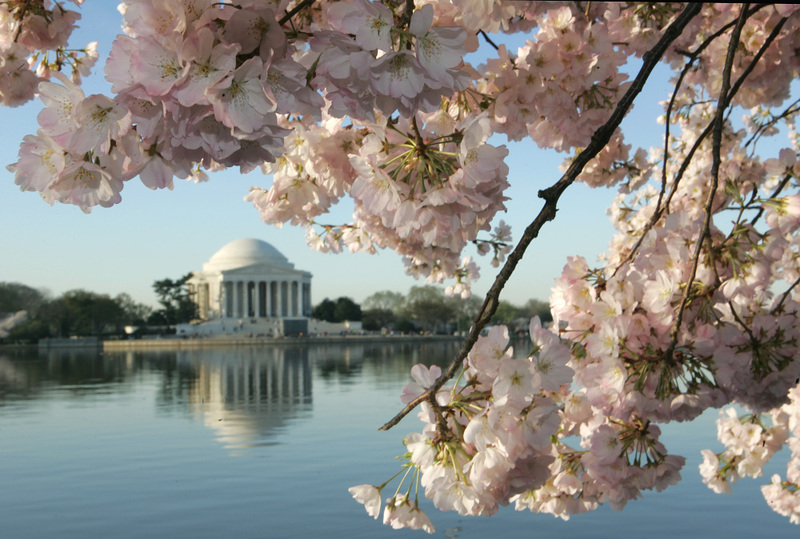 Cherry trees bloom in Washington, D.C.'s tidal basin, with the Jefferson monument in the background. Japan gave 3,000 trees as a gift to the U.S. in 1912. The blossoms are heavy, and they fall to the ground soon after they bloom, says James Ulak, senior curator of Japanese art at the Freer Gallery and the Sackler Gallery in Washington, D.C. "Japanese poets from early on took this as analogous to the ephemerality of life," he tells NPR's Linda Wertheimer, "and this blended with a strong Buddhist notion of transience: things are passing, nothing is permanent." A folding screen from the 17th century in the Seasons exhibit shows cherry blossoms in early spring. In Wind-screen and cherry tree (above) a rope strung around the trees holds up large, ornate brocades. The cloth acts as curtains to block off the area for a blossom-viewing party. In Japan, people still have picnics and parties under the cherry trees — but this year, after the devastating earthquake and tsunami, those outings won't be the same. Ulak visits Japan regularly in his role for the galleries — in fact, he was there just days before the disaster. Waves at Matsushima is part of a 400-year-old set of screens by Tawaraya Sotatsu. It depicts big, stylized waves in gold and silver, engulfing islands and trees. "I think that people who do take the moment to observe the customs will probably seek relief from tension, and also think back about the inherent meaning of these blossoms — that life is short," he says. In the wake of Japan's disaster, it's also poignant to view works that represent Matsushima Bay. It's just north of Sendai, the city hardest hit by the tsunami. The bay has been long known as one of the most beautiful places in Japan. Its views of blue water, craggy rocks and twisted pine trees have attracted visitors and artists for centuries. One set of screens called The Waves at Matsushima is one of the museum's most important treasures. It's a huge piece, with big stylized waves drawn in gold and silver, curling around islands and pine trees. It's almost 400-years-old and very beautiful but eerily evocative of familiar aerial video of the tsunami — smooth, but with bits of foam and moving in all directions. 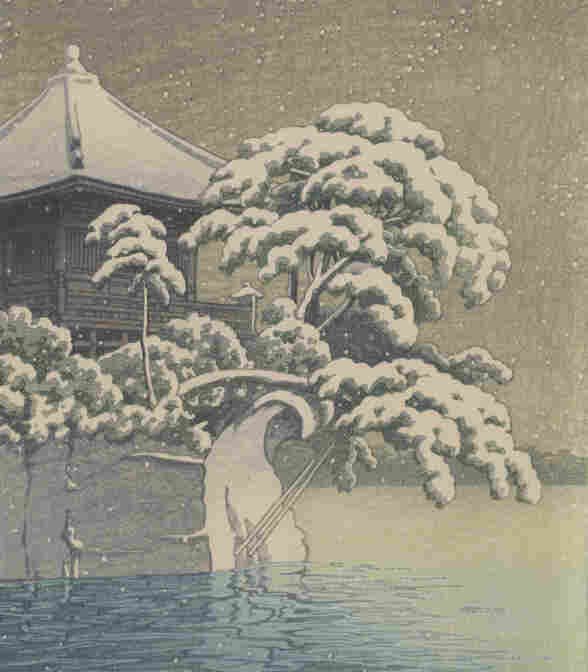 A detail from Snow at Godaido temple, Matsushima by Kawase Hasui, 1932. Click here to see a picture that suggests the Godaido temple may have withstood the tsunami. Ulak mentions a note on that piece from former gallery director Harold Stern — it states that people who have seen the real Matsushima Bay know the water almost never looks like it does on the 17th century screens — it's never that high and stormy. Had Stern "lived to see the events of several weeks ago, how sad [he] would be," Ulak says. "This beautiful view which so many, many people have relied on for centuries for inspiration has been damaged. To what extent, we're not sure." One destination in the Matsushima region is called the Godaido Temple. Ulak points to some photos that suggest the temple is still standing. "Shocking to know that it could survive that," he says, "but who knows?" 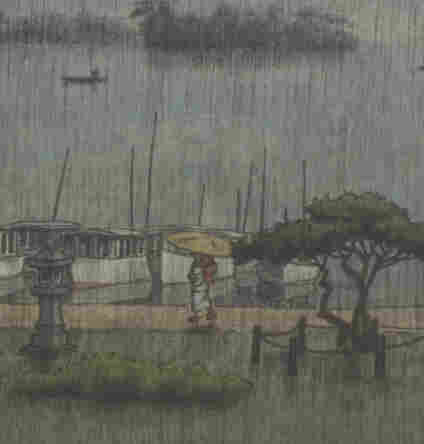 A detail from Rain at Matsushima by Kawase Hasui, 1936/38, shows a woman walking with a parasol along the sea wall. Click "enlarge" to see the full image. 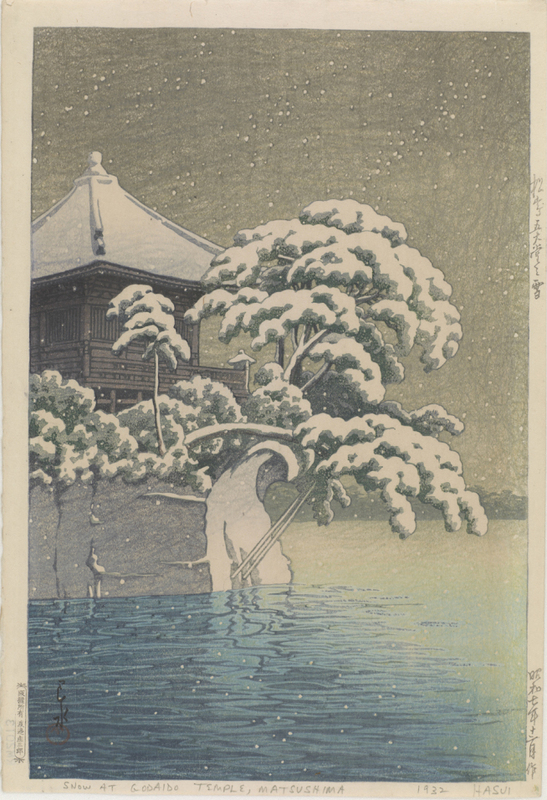 The temple is depicted in a set of prints from a trip to Matsushima by the artist Hasui during the early 20th century. Unlike the ancient gold screen, in these scenes, the water is placid. 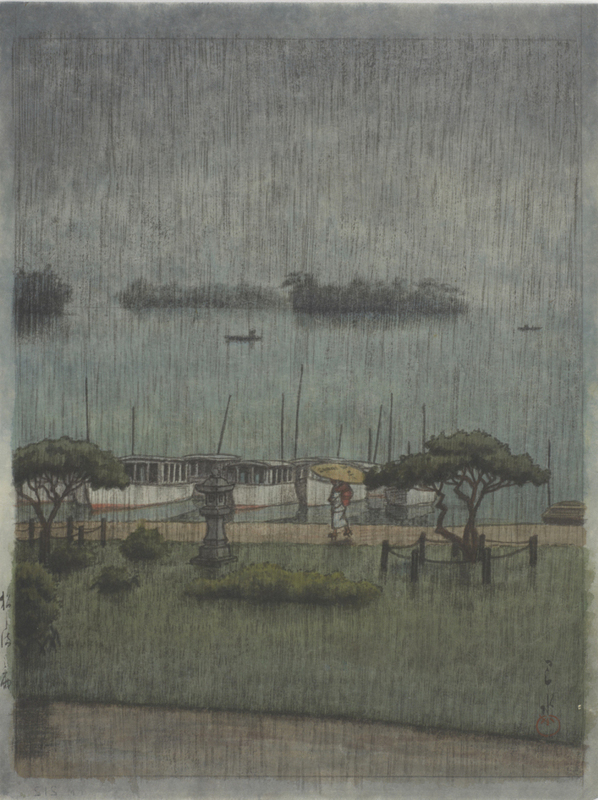 In a rainy, moody watercolor Hasui made from that same trip, a woman holds a parasol while walking along the sea wall — the same sea wall that the tsunami ran right over as though it didn't exist. Scenes like this are especially moving, since they show a part of the country that's tied to Japanese national identity. Ulak suggests the Grand Canyon might evoke a similar response for Americans were there to be a disaster there. Ulak notes the value of having all these works representing this beautiful Japanese bay. "We are fortunate ... to have this kind of a memory of the place," he says. "It will return, it will revive, but never in the same way. So the lesson of the cherry blossom is very much in evidence here."